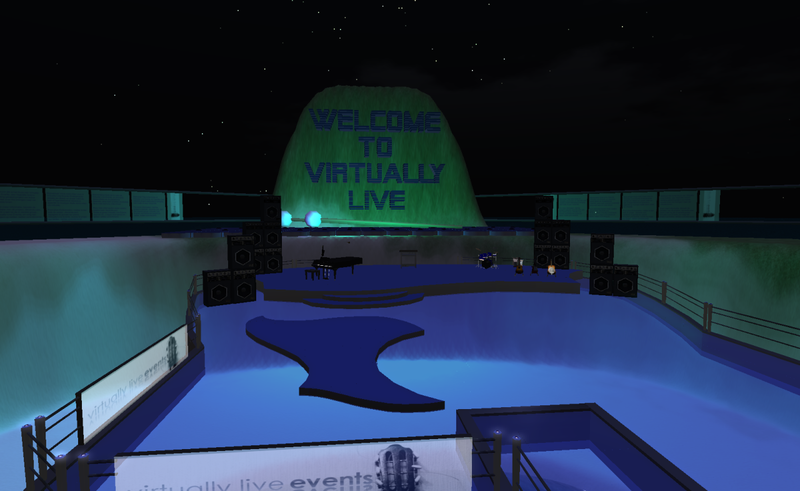 Virtually Live will be hosting a May Makeover Party on Saturday, 15 May 2010, at 7:00PMUTC. The makeover is going well and below is a view from near the center of the region above the new dance, stage, and dj area. In the distance at the southwest corner of the region is the huge new welcome area including a giant welcome sign (made entirely of cubes) and xylophone. We'd like to organize a photo op for the grid where we fill the new welcome sign (it really is *incredibly* large) with avs and perhaps a competent photographer (I am not!) will shoot the photo. Come to the makeover party in two weeks and help organize the idea! Please click on the photo to view the full-sized image. Enjoy!